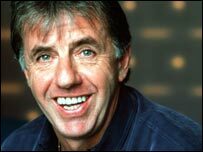 Former Liverpool and Republic of Ireland defender Mark Lawrenson regularly joins Ray Stubbs in the Football Focus studio to analyse the main footballing issues of the day. He is also a match summariser for BBC Radio Five Live and a regular on Match of the Day and has been a regular BBC football pundit since 1997. Born in Lancashire, he began his career at his hometown club, Preston North End, and also played for Brighton and Hove Albion before Bob Paisley paid £900,000 to bring him to Liverpool in 1981. Mark won a series of major honours with Liverpool before an Achilles injury brought his playing career to a premature end at the age of 30. His partnership with Alan Hansen is still regarded by Liverpool fans as the club's best-ever central defence pairing, and he was capped 39 times by the Republic of Ireland. At the end of his playing career 'Lawro' managed Oxford United and worked alongside Kenny Dalglish as a defensive coach at Newcastle. Mark often guested on 110%, the nightly sports show on BBC Choice, and also worked on the digital channel's coverage of the Fifa World Club Championship in January 2000. Mark was a central figure in the 1998 and 2002 World Cups and Euro 2000. He has also embraced the internet revolution, hosting 'Lawro's Live Chat' on the BBC Sport website every Saturday throughout the football season.